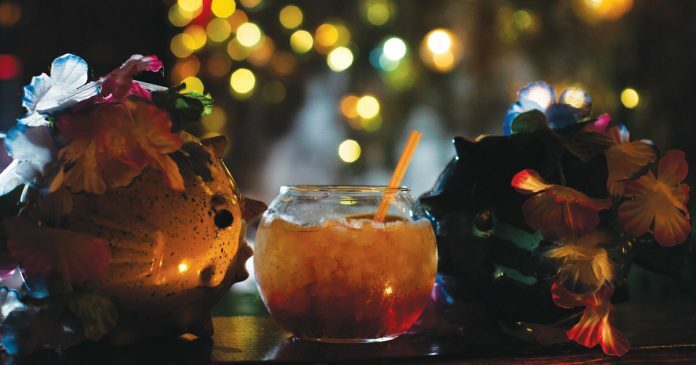 Under a canopy of tiny colored lights and fishing nets, a flock of young Detroiters gather at tables drinking communally out of shared bowls of fruity booze. 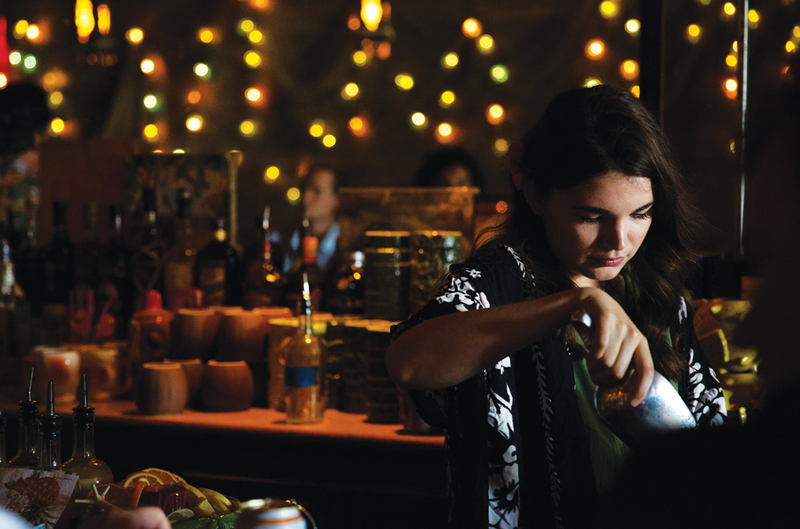 Two women at the bar wear dainty leis and sip umbrella drinks and a bartender in a Hawaiian shirt sends arcs of rum and blue Curacao between icy aluminum tumblers, assembling a flaming cocktail for a couple on a date. It’s a busy Friday evening at Mexicantown’s Mutiny Bar. In Detroit, particularly after WWII, tiki bars represented something hard to find, especially for the price of a rum punch: escape. “The tiki bar was where you could loosen the tie and let the rum wash the worries away,” Martin and Rebecca Cate write in Smuggler’s Cove: Exotic Cocktails, Rum, and the Cult of Tiki (Ten Speed Press, 2016), their definitive history of tiki. Today, while Detroit’s tiki proprietors usually mention cold weather as something people take cover from in their bars, they’re also quick to mention the stressful era we live in. Patrons engage at the Mutiny Bar. The walls at Mutiny Bar recall vacation, with various vintage Detroit tiki menus from long-closed spots like Mauna Loa and Chin Tiki. Mauna Loa had an extensive menu including then very-exotic items like fried rice and a 60-cents-a-bowl “chilled clam nectar.” Chin Tiki, opened in 1967 by Ford engineer Marvin Chin, was known for its elaborate décor including large tiki statues, a bamboo footbridge, and an indoor waterfall. The bar closed decades ago, and when the owner died in 2006, the building was sold and then torn down in 2009. In its heyday, Chin Tiki saw the likes of Muhammad Ali and Barbra Streisand, bringing a kind of Hollywood-meets-islands glamour to central Detroit. While Detroit began its tiki adventure in the 1960s, the Cates’ book traces the origins of these escapist nightspots to 1933 when Ernest Gantt, a sailor and bootlegger who officially changed his name to Donn Beach in 1937, opened the eponymous Don the Beachcomber in Los Angeles. The bartenders were Filipino, the rum came from Cuba, and the mixers from Indonesia. At its origin, tiki didn’t represent any single culture. Instead, like its signature drinks, tiki chose a little bit of everything, threw it in a blender, and hoped for the best. 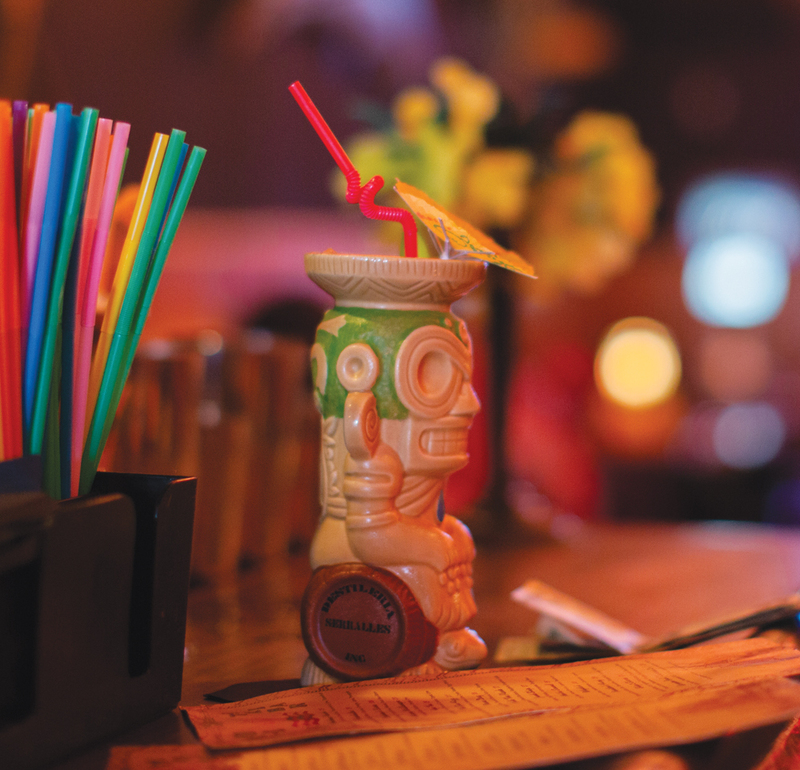 Tiki tends to breed more of itself, too — aping the culture of places like Don The Beachcomber or a really good Trader Vic’s, rather than anything real you’d see in Hawaii or Tahiti. A veteran of Detroit’s craft cocktail scene, Vanderginst, 38, began his career at the State Theatre, then the Magic Stick, and eventually worked his way up to becoming general manager at Sugar House. His partner, Sugar House proprietor David Kwiatkowski, helped Vanderginst with backing and advice when Vanderginst decided to open Mutiny Bar after hosting a series of tiki popups at Sugar House in 2016. Kwiatkowski, a partner in The Peterboro, Wright & Company, and Honest John’s, also found Mutiny Bar’s building — half a storefront on Vernor Highway. “Dave is always looking for new properties,” Vanderginst says. 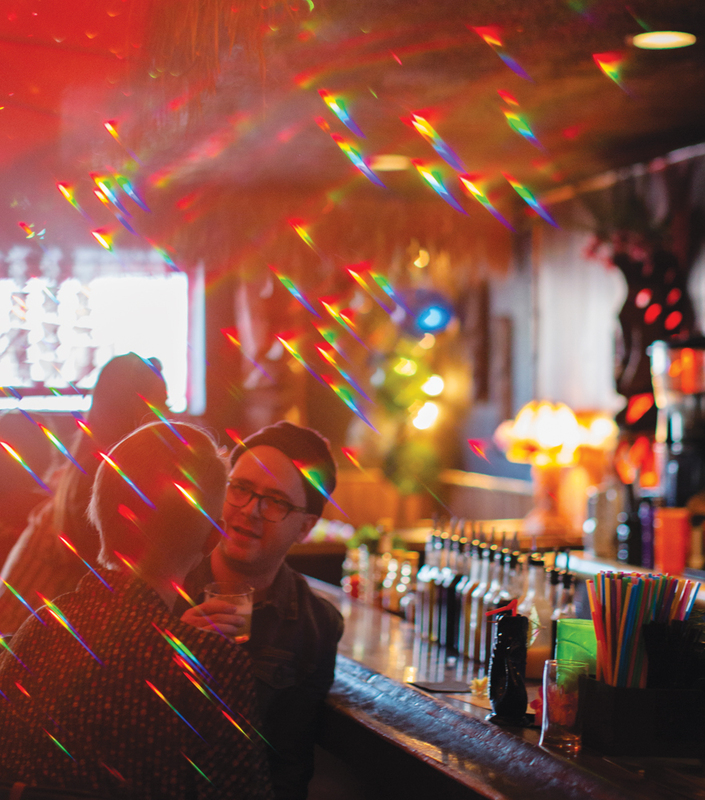 “He came into the space for a drink, and the 80-year-old owners, a married couple, offered to sell him the place.” Kwiatkowski took them up on it, and within three months, Mutiny Bar opened. On a hot Wednesday afternoon, the place is quiet. I sit in what Vanderginst calls the “Lebowski lounge,” an orange and white plastic bowling alley banquette, complete with bottom-mounted cubbies for stowing bowling shoes. Vanderginst offers a Monkey Punch, a passion fruit-tinged elixir served over crushed ice and topped with a brandied cherry and a tiny edible fuchsia flower. “I wanted my first place to be a cross between a dive and something fancy,” he explains, adding that part of the goal with Mutiny Bar was to keep neighborhood patrons coming in. He keeps prices lower than most upscale craft cocktail bars, and swears Mutiny will never offer a single-serve $18 drink. 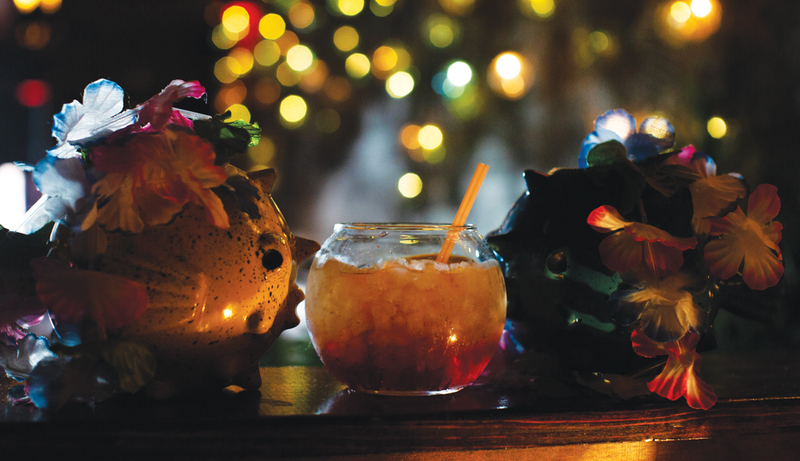 Lost River Bartender Monica Casillas-rios crafts a signature drink. Half an hour across town, a new tiki bar called Lost River opened in June on Mack Avenue in east Detroit. Sharing a block with a fried chicken joint, two hair salons, and a vegan restaurant, Lost River stands out immediately with its black-painted façade, hot pink neon sign, and planter full of ferns. When the bar is open, a lit tiki torch stands upright in the planter, lighting the way to an interior straight out of Blue Hawaii. The space has a pressed tin ceiling, giving it a colonial tropics look, and is softly lit by half a dozen custom wooden light fixtures made by widely known tiki craftsman “Bamboo” Ben Bassham. The bar’s tumblers and lowballs, many purchased from Portland’s Munktiki and English company Bespoke Barware, are beautiful and, well, vacation-y. Pink elephant and octopi mugs share shelf space — each destined to be filled with rum and pineapples. Intricate Tumblers are central to tiki culture. Matt Mergener, 33, owns and operates Lost River with partner Karen Green when he’s not working his day job in ad sales for Google. His large personal collection of tiki tumblers, menus from classic closed Detroit tiki bars, and even a 3-foot tiki head made over 50 years ago as a United Airlines promotion for flights from Detroit to Honolulu, inspired him to open the bar. Mergener, who is tall and blonde, stands out in bright relief against the lush tropical mural that takes up the back wall of the bar. Against a black, velvet-dark coat of background paint, the mural’s bold tropical flowers and emerald palm fronds seem to almost glow, the dark and light tones in the painting providing an unexpectedly effective counterpoint to the long, austere, penny-topped bar. Painted by established Detroit artist Ouizi, the mural went up over the course of a few deeply icy days in February. Despite sparing no detail and creating a luxe space, Mergener echoed Vanderginst’s view that these bars should remain obviously tied to the city of Detroit, and to the working-class streets they call home. “You’ll never see a $15 drink on our menu,” Mergener says. “It’s not easy with craft cocktails, but we want to keep it a neighborhood bar.” To that end, the drinks menu at Lost River includes not only items like Mai Tais, Port Lights, and Fog Cutters, but also a shot and a beer for $7.